Interestingly the Pope Lick Monster in Kentucky shares a nickname also used to describe similarly horned humanoid cryptids across the U.S. - the Goat Man. In the past, we’ve examined the origins of the Pope Lick Monster in Kentucky. Interestingly, this cryptid shares a nickname also used to describe similarly horned humanoid cryptids across the U.S. – the Goat Man. Honestly, it’s unclear how these creatures are connected, if, in fact, they are at all. What we do know is that sightings of half man, half goat creatures are documented in at least four states to date: Kentucky, Maryland, Texas and Wisconsin. 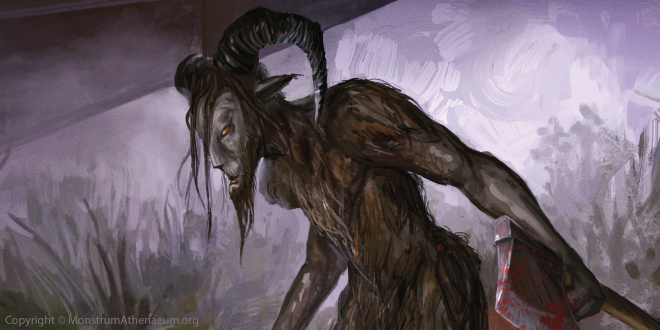 Although it’s possible the legend of the Goat Man goes back as far as the 1700s, it appears likely modern appearances of this unnerving beast began in Wisconsin. Residents have been recounting tales of the Wisconsin Goat Man for almost 150 years, with no end in sight for the cryptid’s infrequent but highly notable appearances. Unfortunately for locals, on those rare occasions when the Goat Man makes his presence known, he’s preparing to attack. Early sightings were accompanied by excellent descriptions of the Goat Man. The beast’s consistently described as having the lower body of a goat and the upper torso of a man. However, the top half of the monster is adorned by ghastly sharp fangs and horns, sounding more humanoid and less human. The lower half of the creature’s body is covered with stringy red hair, hopefully covering up those, umm, goat parts. Spotted in the 1950’s and support by numerous eyewitness accounts over the years, this version of the Goat Man reportedly attacks cars with an axe. 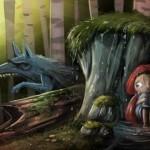 Curiously, there is some debate on the origin of the creature. Depending on which side you’re on, the Goat Man is either an old hermit or the shocking result of a scientific experiment gone awry. Horrifically, there were many unsolved, brutal murders in a Maryland forest back in the 1980s. It’s possible those rumours about the Goat Man attempting to kill witnesses are true. If this is the case, the recent resurgence in Goat Man sightings is a viable reason for Maryland residents to be genuinely concerned. In Texas, the Goat Man is more commonly called the Lake Worth Monster. In 1969, a rash of sightings in the Lake Worth area inspired folks to grab their guns and hunt the beast down. The first confirmed appearance of the Lake Worth Monster is reported to have taken place on July 9, 1969, near Greer Island. Local police indicated they’d received previous reports for a couple of months but had always laughed them off as nothing more than a prank. So what’s so unusual about the incident on July 9th that got them to take the sightings seriously? The very real evidence of an 18-inch gash on the side of a car. According to the local media, the Goat Man/Lake Worth Monster leapt onto a car parked close to Greer Island at approximately midnight. The monster reportedly grabbed for one of the three people in the car, but the driver was able to get away before the intended abduction could take place. 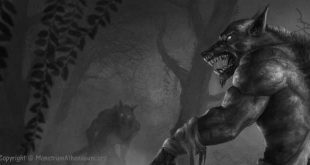 Sounding eerily similar to the actions of the axe-wielding Goat Man from Maryland, it makes sense to assume that they are at least connected, if not the same creature. As previously mentioned, we have taken an in-depth look at the Kentucky Goat Man legend in the past. Since the 1970s reported sightings of a half man, half goat creature bears a strong physical similarity to these other Goat Man legends. Intriguingly, the Kentucky Goat Man may be more intelligent than the rest because it’s reported to utilize a more sophisticated level of hunting techniques. Yes, the Kentucky Goat Man attacks cars just like the Texas version, but the cryptid that calls the Bluegrass State home has also been heard using voice mimicry. This cunning creature may even have mastered hypnosis to capture more efficiently its prey. When you put all of these sightings together, they begin to present a picture of a cryptid species that stalks, at least, four states. The Goat Man also serves as an important reminder that the fascination these beasts hold for most of us does not make them any safer to hunt or approach. Always use caution if you are in an area where the Goat Man has been known to prowl.